I have launched a Go Fund me campaign to raise money for a trip to Liverpool and London. Below is the text from the campaign webpage. I'd appreciate your help and if you think it's appropriate, sending the link to others who may be interested. Me riding a Bixi bike share bike in Montreal in 2010. 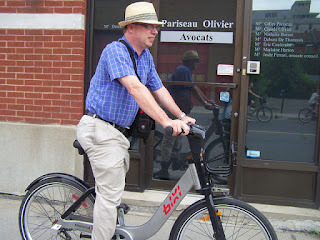 I went as a vacation after my bike planning job ended in Baltimore County, but I ended up writing a bunch of articles about Montreal, including "Is Montreal the number one city for bicycling in North America?." 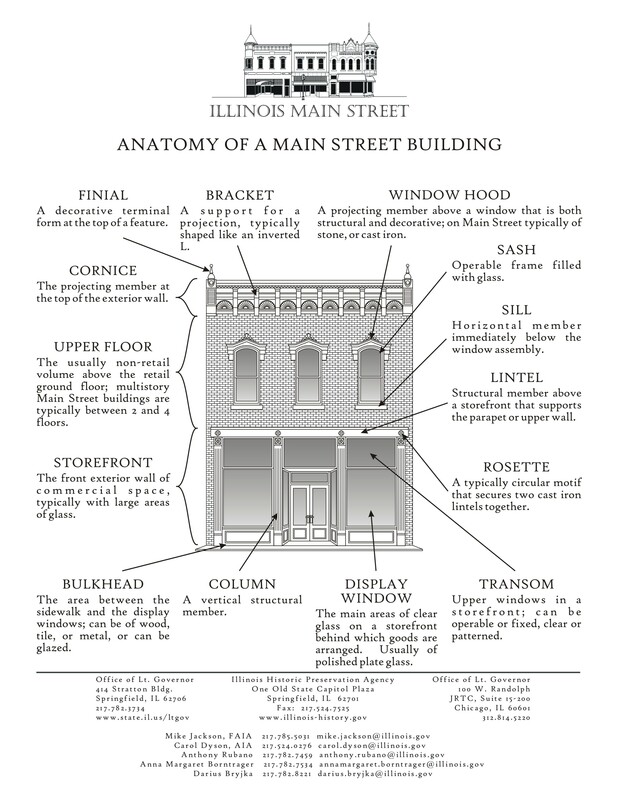 I write the Rebuilding Place in the Urban Place blog on urban revitalization, which has been picked as a top 100 (or better) urban planning blog by a number of sites. Based in DC, I do write about other places and I always write about the places I visit. I've been blogging regularly since 2005 and have published more than 10,000 articles totaling millions of words on all kinds of issues and concerns. A few years ago I wrote a series of articles about culture based revitalization in eight European cities for a EU National Institutes of Culture Washington Chapter project here, and among the places I wrote about was Liverpool. 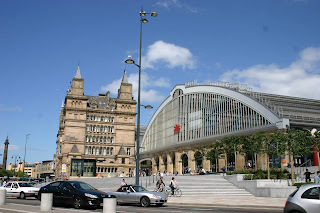 Lime Street Train Station, Liverpool. I get a lot of e-letters and one is from the Place Brand Observer . 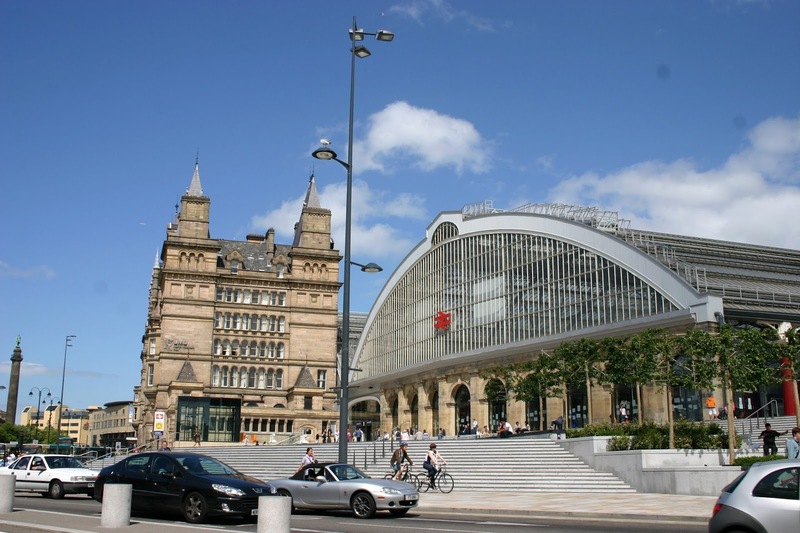 They are holding a conference on city branding, called the International Place Branding Event in Liverpool and offered some free registrations to people who made a good case. As a lark, I submitted my Liverpool article and said it would be great to see in reality what I wrote about from afar without ever seeing it in person. And they picked me. The conference is May 31st and June 1st. -- and undoubtedly many more topics. I didn't plan out everything before I made the plane reservations unfortunately, and I might need to change my flight back in order to be able to try to check out bike hubs at train stations such as Cambridge, which has free bike parking spaces for 3,000 bikes (but I might not be able to get to it if I can't raise enough money). The expenses include airplane, rail trip to Liverpool from London and back, transit, lodging, food, a transit pass, temporary International phone coverage, entry fees to some museums, etc. Besides the conference and travel, the idea is to spend 2.5 days each in Liverpool and London. I know that's not enough time, but it's enough time to learn a lot with plenty of things to write about. I know that many people read my blog and apply ideas to their own situations. In recognition of my "giving back" I hope people will see fit to help. ALSO, if you have suggestions for things I should try to see and articles I should then write about, please let me know. did you get plane tickets yet? Yep. I am definitely going. But I could be hitching and eating bread and water otherwise. I think the DC term is cat food and ramen, but could be wrong. glad you are going. These funding things are a pain but lets see if it works. SAS is doing very cheap fares to Copenhagen for the fall as well. Plane tickets always cheaper when you buy ahead of time. I actually got the ticket right around when I got notice they picked me for a free registration. Still it wasn't cheap, but under $700 including baggage. There was a great article somewhere about "the hacks" people use for flying on Wow and similar airlines, wearing 7 layers of clothes, etc. what do you like about Portugal? I know that every time I see photos of historic Lisbon I swoon. The tiled squares, the crazy streetcars on hills, etc. I can't remember what they call the system of independent lodgings across the country, usually in distinctive, historic properties. Pousadas..., I guess the state privatized them. I've read about them and they sound really cool. ... I know blog commenter charlie really likes Barcelona, albeit it's Southern Europe but not close to Portugal. The weather of course. And the vibe is real laid back compared to Northern Europe. Still great transit (local and intercity) but way more chill. The best quality fresh ingredients I've ever had (and I've been to five different continents). Paris also good ingredients but not as good imo (and the UK is eh). The vibe in Paris is just more stressful and angry too. And yes of course the beauty you described. Nice photos! Their wine is better than ports tho!